A peek into the fitting room! 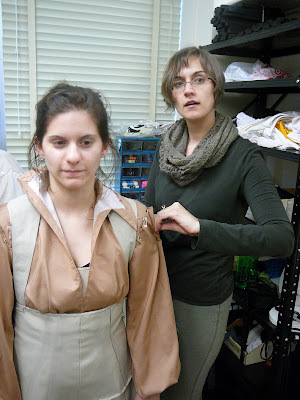 Here I am conducting a mockup fitting for a costume I am draping for a solo dance performance called Corner here at UT. In a unique twist, this costume has to fit not one, but four different dancers. They are relatively close in size, but when you are custom fitting something it really ends up fitting each person totally differently. When you are fitting a mockup, you don't use the actual fabric that the costume will be built out of. Instead, you use a cheaper alternative, focusing on something that has a similar drape, or hand, to what you will be using. You don't want to use a heavy tablecloth type of cotton for a chiffon dress. The pants will be a deep navy blue, almost black, with a grey panel set in the front of the left leg. The blouse will be white. One of the challenges of draping the blouse was the asymmetrical collar. One side stands up and out, and the other falls down almost flat on the collarbone. It took some fiddling, but I'm happy with the one pictured here (probably my fourth attempt at it). In knitting I have begun a new sock, but there has been little time for anything else. I have this vision of four dancers on stage, tearing off their clothes and throwing them to each other to put on. I'm hoping this isn't the scenario! You look like such a pro! That collar looks tres cool. 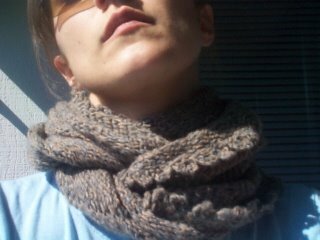 You go with that knitwear - did you make the cowl that you're wearing?